Just to say the drawer knob has arrived, it's very cute and I will certainly recommend K&B to friends and family from now on. Thanks for the personal service too, it's quite unusual these days! I am writing to you to say how much I appreciate your most efficient service I have received regarding my recent purchase of the above knobs. They are fantastic. They are going in my new kitchen which is being built at this present time. We have already put some on the units and they have been admired by all. Once again many thanks for your prompt service and will not hesitate to recommend you to anyone who is interested in your goods. My order arrived today - just what I wanted and I'm very pleased with them! Quality great and better than I expected! Your service, communication and packing was excellent- I shall certainly be buying more in the future and will recommend your products to friends! Would be great if other sites were like yours but alas that is not the case - yours really stands out! Want you to know how THRILLED I am with my knobs & bobbles! service was exceptional. I'm delighted I came to your fabulous store! The doorknobs I ordered have just arrived, and I wanted to let you know I am absolutely delighted with them! Thank you so much for the lovely coat hooks and door knobs. Your alternative suggestion for colour for one of the cupboard knobs was greatly appreciated, as was the speed of delivery. I shall definitely shop again with you in future and recommend you to my friends and family! They are stunning !! Cheered up our kitchen a treat, thank you for all your help. We’ll be back as soon as I can find something else to cheer up !! They are perfect, thank you so much. You now have a loyal customer, I will be ordering again from you. Just wanted to say my order arrived today and they are wonderful! Thank you! Just a note to say how gorgeous the hooks and knobs are which I ordered, and received this week. When they have been fixed to the mounting board and put up on the wall, I will send you a photo! Thank you for all the beautiful knobbles! They are decorating our furniture and put a smile on people's faces! Morning Lucy, door knobs have arrived, so lush!! Be ordering more in the New Year. Hope you have a great Christmas. I've received my replacement knob this morning and its perfect. Thank you for sending me this and just want to say that I have really enjoyed shopping with you. Your customer service is excellent. You took numerous photos for me to help me select my favourite product and your prompt communication throughout was a breath of fresh air. Hi Lucy. Fitted the knobs to my kitchen cupboards at the weekend and they look fantastic! Well impressed. I've left you 5 star feedback and just ordered a couple more for the vet and spice drawers. I just want to say I am really pleased with my order and will definitely be back for more! The website doesn't really do the quality of these justice. Many thanks for your prompt and efficient service. The door knobs arrived safely earlier this week and I am thrilled with them. May I say thank you very much for the door stops which I received today, they are so pretty and I am very pleased with them. Thank you for the prompt despatch also. Just wanted to say I received my placemat set and it looks even nicer than on the photos! Very pleased with it. My new drawer knobs have arrived and I have put them on my telephone table drawers and they look fabulous, lovely quality. Thank you very much. We are so thrilled with our order , it has transformed our wardrobes many thanks. Thank for your prompt service, the handles arrived today and they are lovely! Hi. Just like to say thank you for my order. They are beyond perfect for my project. Chuffed to bits. The knobs arrived this morning. Now fitted and I am thrilled. My door knobs have arrived and I am so pleased with them-I love them, they’re even nicer than they looked on your website. Great service and will definitely use you again. My order has arrived today and I love them with a capital L! Fastest service ever, beautifully wrapped and they will look divine in our kitchen. Hi just wanted to say our order came quickly and they are excellent quality for the price and cheaper than anywhere else. We will use you again. I've been meaning to say a huge THANK YOU for our stunning new door knobs and chest of drawers knobs which were recently dispatched to us. They have completely transformed our 12 cupboards and a huge chest of drawers - completely gorgeous. I can't tell you enough the difference they have made to the decoration of the room. Thank you for such a great product and such brilliant customer service! I am really delighted and know a couple of people already interested in ordering from you having seen them! Just to let you know the colourful dots knobs arrived and are fitted, they look fabulous. Thank you so much for your personal service. It’s been a pleasure to give you my business . I will be ordering again and will also tell all my friends !!! Just to let you know I received my parcel today. And I can't tell you how pleased and delighted I am with my items. They truly do look lovely on my chest of drawers. 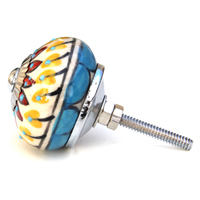 Hi Lucy just to let you know that I have received the door knobs today and I absolutely love them. Sometime in the not too distant future I will be ordering more when I change the other doors. Thank you so much for your prompt delivery and excellent communication. I just wanted to say we LOVE the knobs we chose for our refurbished dresser and Thank you for such prompt delivery to enable it to be finished on time. Thank you for my order of 9 sets of door knobs. I am really pleased with them and with the way you let me know the status of my order. I will strongly recommend Knobbles and Bobbles to anyone who needs door knobs, once again many thanks. Thank you for the drawer knobs, they are lovely and I wouldn't hesitate to order again. Thank you so so much for my lovely knobs. I absolutely love them :) I wondered if there was a way i could leave some customer feedback ??? Your website is fantastic & i will definitely use it again. Thanks once again. Good morning Lucy - just a note to say that we have received our knobs and are extremely pleased with them and your service - so thank you very much. Just to say we received the knobs we ordered from you today. Such a brilliant service , thank you. They will look really lovely on our new kitchen cupboards. I received my door handles today and want to say how beautiful they are! I love them all. Will be ordering more once I move. The service was excellent too. Thank you so much! Just to say thanks again for your excellent customer service and pictures sent. We are delighted with the handles and will not hesitate to use your company again and recommend you to friends. My beautiful knobs arrived today and I wanted to let you know how delighted I am with them. The quality is far above expectation as is the design even my husband couldn't believe how gorgeous they are for the price. Your customer service is also excellent, knobs ordered Thursday afternoon, arrived Monday morning with emails keeping me informed. I'm so impressed with your products I'm going to have to start all sorts of projects just so I can buy some more, I've already got my eye on your hooks! So happy and really looking forward to putting them in. We have just fixed 29 different design blue knobs to drawers and wardrobe doors in our bedroom. They look lovely - I am so pleased with them. I can't believe the difference they have made to the room. The service I received from you was excellent and after ordering, the knobs arrived within a couple of days. Thank you so much. Thanks so much for the hooks- love them and can't wait to get them up. Great service, comms and product- will certainly recommend to others. Thank you Lucy the knobs arrived today,I love them❤️ great customer service. Just wanted to let u know the coat hooks have arrived. The new knobs arrived today and they're great. Really make such a difference to the kitchen. Received these today. Very pleased with the product, excellent quality at a very reasonable price. Your sevice was superb. Feel free to tell all your customers that I think you are fab. Just to let you know the knobs arrived today and I'm really chuffed with them. Such a great price, quick delivery and exactly what I was looking for! I'll definitely be recommending your company and shopping with you again. Hi, I gave my mum one of your burners with a selection of different melts for Christmas. She came to stay this weekend and was absolutely raving about it! She couldn't believe how long the melts lasted and how lovely the scents were. She assumed I had bought one for myself so I would know how great they were, but I didn't and now think I ought put that right, oh, and by mum some more melts too! Thanks so much. Vicki. Hi I've just received my linen bar this morning. Just thought I'd let you know they're amazing. I used 2 squares in my burner and I can smell them through the house. My knobs arrived today and I love them thank you! I now know where to come each time I need more for my furniture painting venture!